Photo by Todd Winner. Looking "up" at Oil rigs Eureka in Orange county, California. 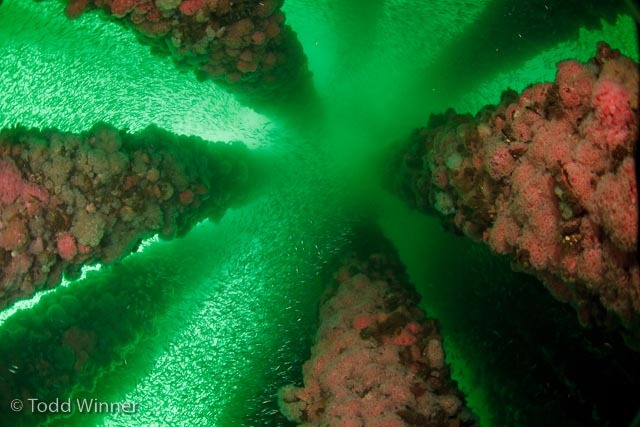 Schooling rockfish surround the columns. I'm always looking for ways to photograph ordinary subjects from a different perspective. This can be achieved through the use of angles, lighting, lens choice, etcetera. Just something to make it stand out amongst similar images. Much of the time my inspiration comes from viewing other underwater images but just as often it comes from topside images. For this image I was thinking about the many photographs I have seen of giant redwood trees shot looking straight up. I think this shot has a similar feel and the green water with the bait fish only adds to it. I'd like to say I had the perfect camera setting for this shot but bumping up the iso and stopping down the f stop probably would have improved it. 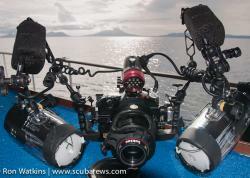 I was borrowing a Canon 7D and a Nauticam housing for this dive and I was still fumbling with the controls a bit. In the end the shot was made using a Canon 7D, Tokina 10-17 at 10mm, ISO 160, 1/13 sec at f/4.5 Two Inon Z-240 strobes on low settings with defusers. 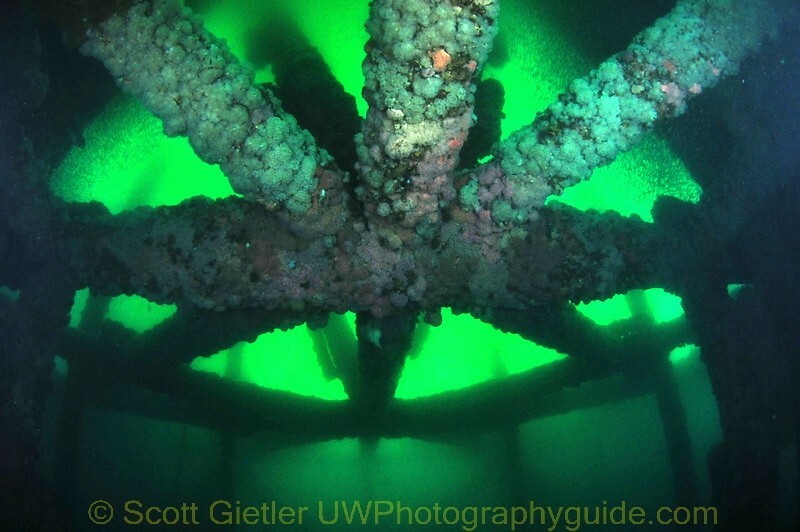 Photo by Scott Gietler, Oil rig Eureka. Here I'm at a different section of the rig than Todd was at, and I'm a little deeper. You can still see all the fish in the background. I wish I could say I was inspired by redwood trees like Todd was, but I just sort of looked up and liked this composition. Looking straight up is not natural for me, and sometimes I have to force myself to do it. This shot was taken a little deeper than I normally was on the dive, so I guess you should always swim underneath structures and look up to see if there is a good shot. Being in the deep clear water helped prevent backscatter. It was pretty dark on this dive, which means I can shoot up towards the surface and get a good dynamic range. The green color comes from slowing down by shutter speed (at ISO 200 it would have been at 1/13th of a second equivalent) and getting the sunlight coming through the green water. 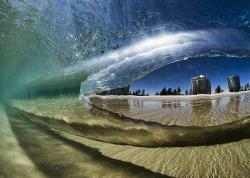 A wide fisheye lens and 2 strobes are essential for this type of shot. Nikon D300 + Tokina 10-17mm@10mm, dual Inon Z240 strobes out wide to the sides on high power, 1 stop below full. F7, 1/50th, ISO 800. Contrast and levels adjustments were made afterwards in Lightroom to make it look less dull. Submitted by Anonymous on Wed, 2010-05-26 07:58. I'm a newbie to manual settings and love to read what settings were used for each shot. Thanks for posting - this was very helpful!